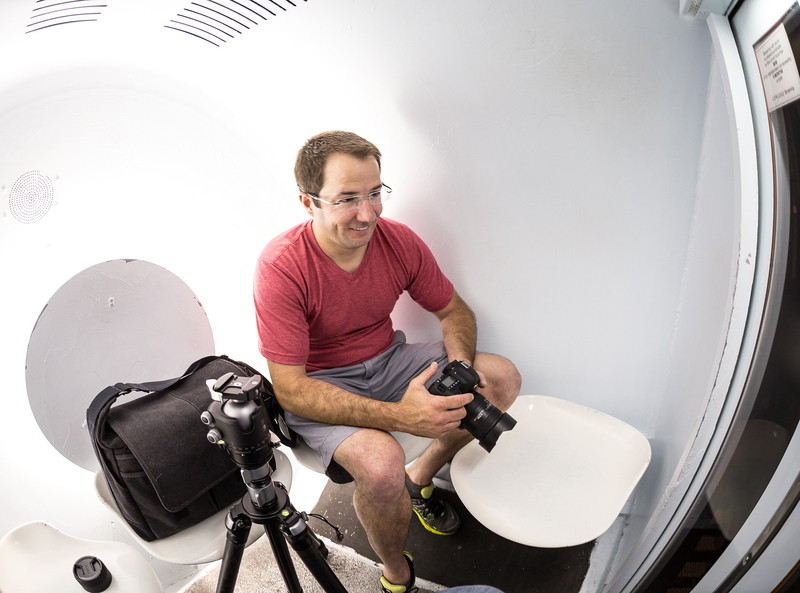 Thursday, the day before the show at Creve Coeur Camera in St. Louis, Ryan Brown, Missouri’s professional photographer of the year for 2013, and I visited the Gateway Arch. As a personal challenge, I took only one lens, Sigma’s 15mm f/2.8 fisheye. This was my fourth trip to the Gateway Arch. It was the first time that the tram to the top was available. A mutual “Let’s go!” found us in one of the eight tiny five-passenger capsules comprising the South tram on our way to the top. The capsule rotates according where it is in the the arc of the Arch. Ryan in the tram capsule. The fisheye view makes it look much larger than it is. What’s this? Yep. A wedding ceremony was underway at the top. Notice that their photos are being made with an iPhone and a point and shoot. Ryan and I offered to share the photographs we’d made. “Not interested.” was the reply. Oh well. Maybe they’ll see this one. Here’s the view of downtown St. Louis from the window behind the happy couple. 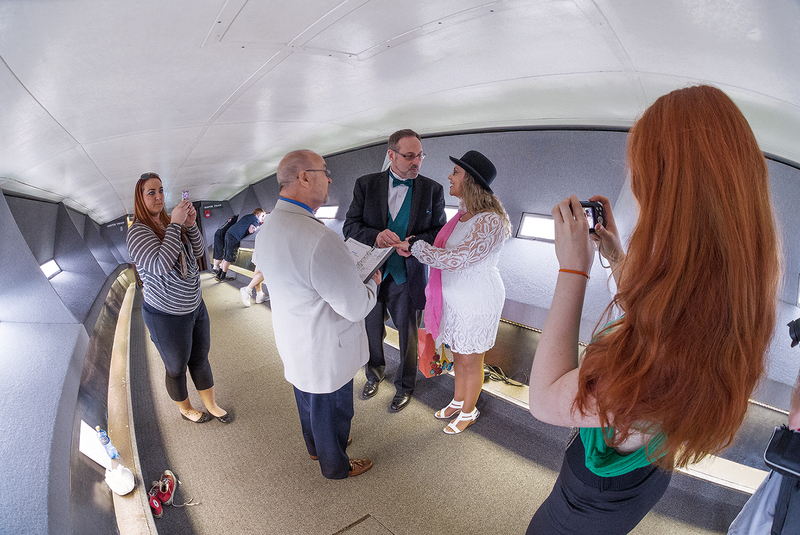 In my next post, I’ll show some fisheye views of the Arch. 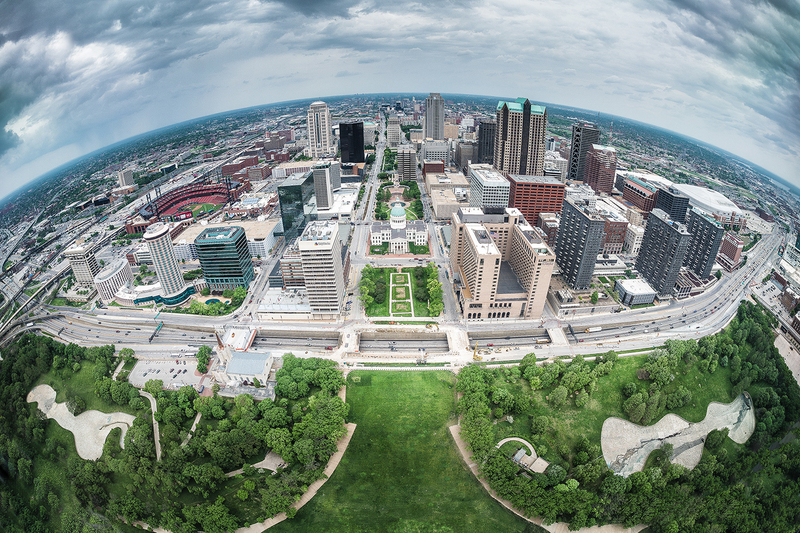 The curved horizon behind the downtown skyline is similar to the shape of the Arch itself thanks to the full frame fisheye .